The all-new Sandals South Coast is the perfect combination of European civility in an all-beachfront resort. 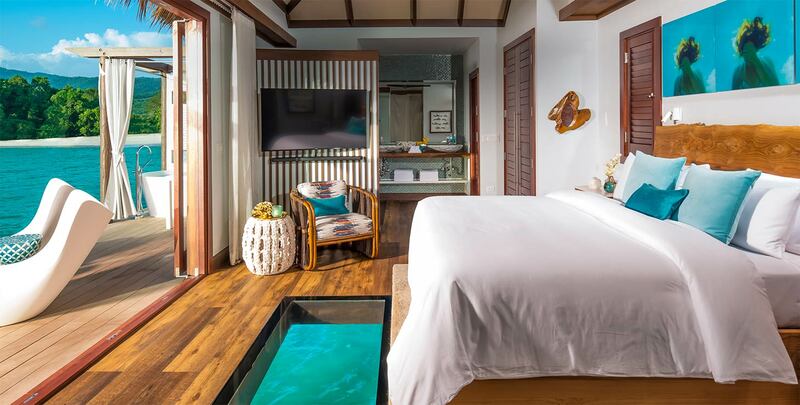 From all-new Over-the-Water Bungalows, an overwater bar, and a romantic Over-the-Water Chapel, Sandals South Coast brings guests closer than ever to the water. Set on a 2-mile stretch of Jamaica's south coast's most pristine white-sand beach and nestled within a 500-acre nature preserve, this spectacular seaside oasis features three distinctive European Villages. Relax by one of three pools, including Jamaica's largest, or dine at the new Sushi on the Sand restaurant. At night, extravagant bonfire areas and fire pits add to the glow of this truly unique destination in the heart of paradise. Perched above clear turquoise waters, these 12 Tahiti-style bungalows feature breathtaking ocean views and exclusive amenities. Sandals South Coast's newest bar, Latitudes° Over Water Bar, features 360° ocean views from its prime location just off the coast of a 2-mile pristine white-sand beach. Enjoy sunset cocktails gathered around the intimate fire pits or lounging on an hammock suspended above turquoise waters. Sandals South Coast’s newest seaside restaurant, Sushi On The Sand, offers fresh rolls, sashimi, salads and more alongside beautiful views of the Caribbean Sea. The latest addition to Sandals 5-Star Global Gourmet™ dining, Sushi On The Sand brings Far East fare to the Caribbean. Sandals South Coast's all-new, all-beachfront redesigned accommodations showcase spectacular views of the Caribbean from private balconies and walkout patios. Just steps from the water's edge, these suites are designed to bring the outdoors in and feature Tranquility Soaking Tubs™ for two. 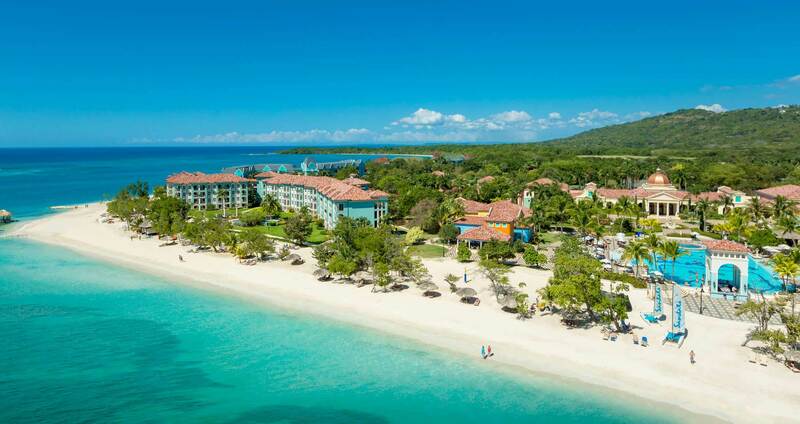 Sandals South Coast is perfectly positioned along a two-mile stretch of unspoiled, pristine white-sand beach. Ideally suited to both relaxation and romance, enjoy gorgeous views of both the sunrise and the sunset while drinks are delivered right to your chair by a beach butler. Using only the freshest ingredients, our chefs create authentic regional specialties – Italian, Asian, Mediterranean, Caribbean, Jamaican and more. Dine along the beach, at a romantic table for two, or on the piazza. No matter where you dine, everything is included at our 9 specialty restaurants. From chic gatherings to exciting shows, theme parties and events, no one throws a party like Sandals because here every night is a celebration. Sandals offers the most comprehensive scuba diving program anywhere. From regulators, BCD's, masks, snorkels, fins and tanks to state-of-the-art, twin diesel Newton boats and expert guidance from our PADI® certified dive professionals - we've taken care of everything. Tennis, day and night, on lighted courts surrounded by fragrant tropical flowers and cool breezes that flow through towering trees. Croquet on emerald-colored manicured lawns. Volleyball on pillow-soft sand. Plus, our multi-million dollar fitness centers are equipped with state-of-the-art Life Fitness equipment and certified instructors. At Sandals South Coast you can enjoy three unique poolside experiences, including Jamaica's largest zero-entry pool and two Renaissance-style pools. Swim up to the bar or reserve a poolside cabana where your butler will deliver cool drinks with a warm smile. Whatever you dream your wedding to be, our new Over-the-Water Serenity Wedding Chapel will surpass your expectations. This unique and picturesque venue features stunning 360-degree, panoramic water views and a glass floor aisle, so you can truly be walking on water on your special day. Sandals South Coast’s all-new, all-beachfront accommodations showcase spectacular views of the Caribbean from private balconies and walkout patios. Every dining experience at Sandals South Coast has been designed to please your palate. Using only the freshest ingredients, our chefs create authentic regional specialties - Italian, Asian, Mediterranean, Caribbean, Jamaican, and more. Dine along the beach or on the piazza. No matter where you dine, everything - including our specialty restaurants - is included! For inclusive offer, the $605, $505, $405, $305 & $225 Instant Credit are in USD, applied to the base fare and excludes government taxes and fees, which must be paid at time of booking and is fully non-refundable.